We expect Wilmar to report a 4Q17 core profit of US$360m-380m (3Q17: US$323.7m, 4Q16: US$589.5m) and a better qoq performance on higher contribution from the tropical oils and sugar divisions. However, we expect weaker yoy results on 4Q16’s high base which was due to an unusually strong contribution from the sugar division and the oilseeds & grains segment’s strong performance (on front-loading due to early-17 Chinese New Year demand). Maintain BUY. Target price: S$4.10. 4Q17 results preview: Expect core net profit of US$360m-380m (4Q16: US$589.5m, 3Q17: US$323.7m). Wilmar International’s (Wilmar) 4Q17 results are likely to come in higher q-o-q but weaker y-o-y. Results are scheduled to be released on 22 Feb 18 after market close. Expect weaker yoy performance in 4Q17 as the strong 4Q16 results will not recur. High sugar division contribution: Sugar harvesting was delayed to early-Jan 17 so 4Q16 registered higher crushing volume vs 3Q16. Strong oilseeds & grains performance: Front-loaded Chinese New Year demand in 4Q16. Strong tropical oils division earnings supported by palm oil production volume which picked up strongly in 4Q16 after 9M16 suffered a severe drought impact from 2015’s EL Nino. Higher contribution from tropical oils division: This segment is expected to report a stable palm refining margin and sales volume. Biodiesel deliveries are back on track and are expected to contribute positively to earnings. Better performance from sugar division: This would have been supported by higher sugar merchandising and processing sales volumes from a higher contribution from the Brazil JV. Higher sales volumes are likely to have been partially offset by lower PBT margins. 2017 was not a good year for sugar; sugar prices did not live up to market expectations due to the unexpected release of sugar reserves by the Indian government to make up for the production shortage post El Nino. Tropical oils: Higher sales volume and stable refining margin. This division should report a better qoq but flat yoy PBT for 4Q17 (4Q16: US$184m, 3Q17: US$84m). PBT was largely supported by higher sales volume and a stable margin. Sales volume is expected to have increased on the back of higher upstream production in 4Q17. Group refining margin is expected to have been better than 2Q17’s and 3Q17’s. Meanwhile, biodiesel deliveries were back on track and are expected to have contributed positively to earnings. Based on channel checks, sector biodiesel deliveries in 4Q17 could have been slightly higher than allocated and this is slightly positive to all biodiesel players. Sugar: Merchandising volume still strong. We are expecting a better qoq but weaker yoy PBT for 4Q17. The strong performance in 4Q16 will not recur as milling volumes were unusual last year and peaked in 4Q (vs sugar harvesting and milling which normally takes place in 3Q). The sugar segment’s performance was highly dependent on sugar merchandising and processing as the sugar milling business was affected by both low sugar prices and lower production volume (2017: 10% lower yoy as Cyclone Debbie in 2Q17 affected crop conditions). Moreover, the change in timing of sales could lead to sugar sales from last year spilling over into 1Q18 (vs previous years when sugar sales for milling are completed in 3Q and 4Q). The weak contribution from milling could have been partially offset by higher sugar merchandising and processing sales volume which was supported by a higher contribution from the Brazil JV. Oilseeds and grains: Delay in festive demand for consumer packs. This division is likely to register a weaker qoq and yoy PBT. 4Q16’s stronger performance was supported by front-loaded Chinese New Year demand. We understand that soybean crushing still saw positive margins and Wilmar had sufficient soybean to cater to soymeal demand in China for 4Q17. Meanwhile, consumer packs sales are expected to be lower yoy in 4Q17 as festive demand will only come in 1Q18 with Chinese New Year falling in February. Proposed biodiesel consumption of 3.5m kl for 2018 is achievable. The Indonesian government plans to expand biodiesel subsidies to cover consumption of biodiesel by the mining sector (non-PSO segment) this year. With the subsidy, the non-PSO segment is expected to consume 1m kl of biodiesel, bringing 2018 biodiesel’s consumption target to 3.5m kl (2017: estimated at 2.53m kl). Management believes that the target of 3.5m kl for 2018 is achievable as the recent weakness in CPO prices and strengthening of Brent crude oil prices have narrowed the premium gap between CPO and gas oil prices (from US$118.1/tonne in 30 Oct 17 to US$20.0/tonne in 15 Jan 18). This will make the biodiesel policy financially viable as the required subsidy would be lower. The proposal will increase biodiesel consumption in Indonesia and act as support to CPO prices. However, the financial impact to Wilmar is minimal. If about 35-50% of the additional volume for the non-PSO segment is allocated to Wilmar, it would account for only 1% of Wilmar’s total manufacturing capacity. China listing is on track. 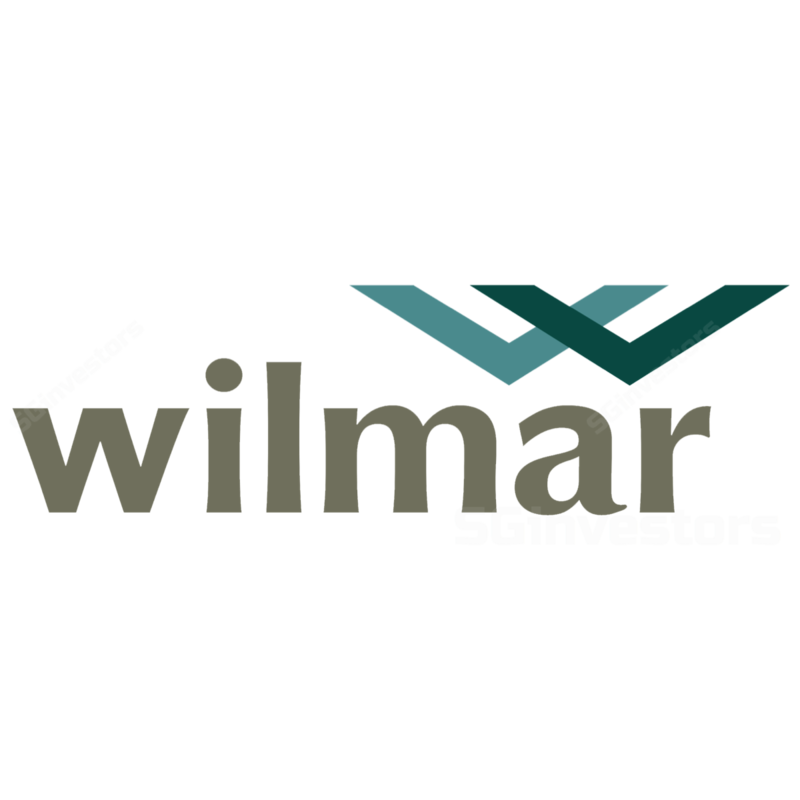 We understand Wilmar’s plan to list its China operations on China’s A-share market is on track. Wilmar has completed internal restructuring. The listing application will start after Wilmar China completes one full financial year of reporting, i.e year ending 31 Dec 18. Depending on the listing queue, the listing could take pace in 2H19 or closer to 4Q19. Maintain earnings forecasts. We forecast an EPS of 16.5 US cents, 19.8 US cents and 22.7 US cents for 2017-19 respectively. 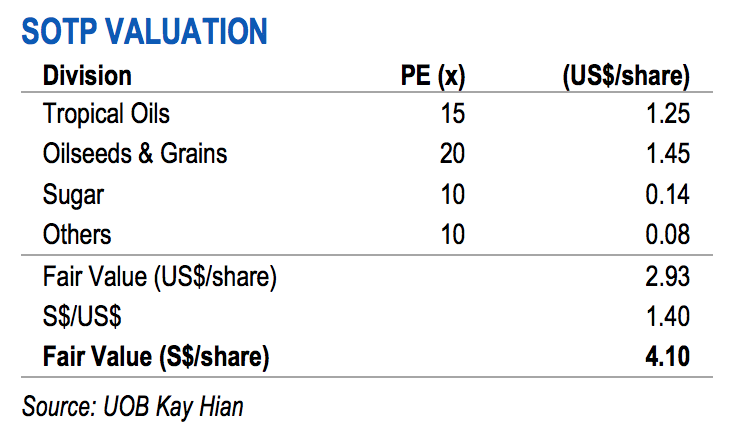 Maintain BUY and SOTP-based target price of S$4.10. This translates into 14.0x blended 2018F PE, which is slightly higher than its 5-year mean (1-year forward PE of 13.2x). We peg the oilseeds and grains division to 20x 2018F PE to factor in the potential listing and assume that this division runs entirely based on its China operations. We value the tropical oils division at 15x 2018F PE, and the sugar division and other businesses at 10x 2018F PE respectively. The potential listing of its China operations. As more details of its China operations are made available for the listing process, investors might see greater value in Wilmar.